The Espresso Book Machine at Bartell Drugs in Seattle’s University Village shopping mall. 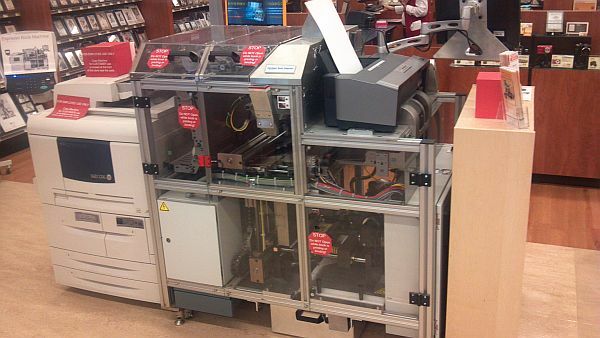 Aspiring authors in Seattle can now print copies of their novel while waiting for a refill of their prescriptions. The Bartell Drugs store near the University of Washington has installed an Espresso Book Machine as part of a pilot project with Kodak Alaris. The machine can print single or multiple copies of a book uploaded to the machine, in much the same way consumers can walk up to a Kodak photo kiosk and get on-demand prints of digital photos. The print-on-demand service is integrated into the kiosk’s menu of services. The EBM at Bartell’s is one of only three in Washington State. The Digital Reader and online trade publications reported the venture earlier this week. A clerk at the Seattle store said the machine was installed about two weeks ago, and that Bartell’s was working on a web interface for the project. If the web interface is similar to other printing and copying services, writers will be able to upload PDF files from home and pick up the printed books at Bartell’s when they’re ready. Based on the marketing material at the store, Bartell’s and Kodak appear to be targeting writers, poets, students, and genealogists who want to see their work in print, but don’t want to go through the arduous process of traditional publishing or independent publishing through author services companies, such as CreateSpace or Lulu. According to a price sheet at the store, authors can purchase a basic cover design for $150 and formatting services based on word count, ranging from $299 for a manuscript with 25,000 words or less, to $449 for books up to 150,000 words. Authors can buy one or more copies; pricing starts at $7 per copy plus $.03 per page. A 100-page book, for example, would cost the author $10. The price sheet has no information on ISBN purchasing or marketing services. As you might expect, Kodak and Bartell’s is pitching print-on-demand as an easy and cheap way to get published. The reality is very different. The vast majority of writers know little about cover design and layout, meaning most will want to purchase these features. A 100,000-word novel plus cover will run $599. Assuming the novel runs the standard 300 pages (give or take), each copy will cost $16 ($7 plus 300 times $.03). 100 copies will run $1,600, bringing the total price for a typical project to $2,199. EBM services may be more appropriate for small books of poetry and family histories, which have fewer pages and simpler design needs, and thus lower costs. What do you think? Will you use Bartell’s POD service? Ah, so that’s what it looks like. Good to know.